+ Added Russian .lang file, translated by Wolfpup and Indeed. % Further tweaks to GUI handling. + Added new GUIs for more multiblocks. % Rewrote the way multiblocks in GT++ handle GUIs, to allow for more flexibility. % Logging clean-up for turbine removals. % Shuffled some things around in the proxies. + Added recipe for Large Mixer controller, closes #355. + Added a cut-off point for all sizes of Turbines, so all useless ones are now removed entirely. Closes #344 via implementation. - Removed EIO fuels being registered when in GTNH. % Made Ethylbenzene knocking recipes require EV for GTNH, or HV otherwise. % Made Substation Redox cells more expensive. Closes #331. $ Fixed a handful of custom armour bugs. $ Fixed repulsions of entities on the Tin Foil Hat. + Added the legendary Tin Foil Hat. Part of #343. $ Fixed a bug that would occur using older GT versions, due to materials not existing. Fluids are now obtained by name, and if none are found pollution outputs are disabled. $ Fixed an issue where old style circuits would constantly load up, ignoring all configuration settings. $ Tweaked Vanilla Sleeping at heights fix. + Added an interface for bug fixes, for future flexibility. $ Fixed a bug where adding valid biomes for villages in Australia could cause an UnsupportedOperationException. + Added new Beta Tester for Capes. $ Fixed weird crash with GT++ Ore Renderer, no idea what caused it. Closes #329. $ Fixed Pollution scrubbers, which now have the correct slots automatable. Closes #346. % Updated scrubber tooltips to reflect that the rotors are not automatable. $ Re-added code that got diffed out by mistake. $ Fixed a rather major issue which effects all GT++ Multis. Log files should no longer grow by the gigabyte every hour. % Made the Large Extruder and Large Wiremill be more flexible on where they allow hatches/buses when built. Closes #350. + Added Forming Press mode to the Large Bending Machine. Closes #347. + Added a command to dump TC aspect information from all Items & Blocks. Use /DA or /DumpAspects to begin the process. $ Fixed PSS not accepting any tier Hatches. Closes #354, also fixes https://github.com/GTNewHorizons/NewHorizons/issues/3470. $ Fixed Hand-Pumps duping things, because other modders can't follow guidelines. Closes #353. $ Fixed a rare bug involving Hand-Pumps & EU items having getDisplayName() called on them. $ Fixed an issue where some Multiblocks had a bad GUI. $ Removed TC libs from my custom Railcraft build. $ Fixed some invalid recipe logging for recipes that contained nulls. $ Fixed Custom ores not having a default texture. % Moved Pump Logging, it was moved to WARNING from INFO. - Removed most of old Pump tool code. + Added generic token type items to use for various trades. $ Hopefully this fixes Hand Pump recipes. $ Small Pump fix that allowed mis-use when right clicking. % Moved Ender Pearl fluid extraction to the base TF recipe class. + Added recipes for all 4 tiers of hand pump. $ Fixed pumps not emptying Vanilla fluid tanks. $ General pump behaviour fixes & improvements. % Nerfed the PSS, it not longer accepts Energy/Dynamo hatches < HV. % Updated Power book to reflect changes to PSS and added minor details about Redox cells. % Finished GT tank handling for Hand Pumps. + Basework for a GT++ based Hand Pump. + Added some ore veins to Australia Dimension. + Added the Base work for a Hand pump, that removes fluids from the input tanks of GT machines. + Added ability for Assembler recipes to use OreDictionary. % Changed recipe for Project Table, LAC Controller & Casings to now use TungstenSteel instead of Stainless Steel. % Changed recipe for all PSS Redox Cells. % Made tooltips on all multiblocks more descriptive, They now identify what base machine they are more easily. % Updated Large Assembler Tooltip. $ Fixed capes not displaying differently for other players. $ Fixed Charging Hatches displaying wrong inventory size. Closes #332. % Updated tooltip to better reflect output bus requirements. Closes #333. + Added a fix for beds when sleeping above Y >= 127. % More functionality to Forge Srg handling. $ Fixed two Multiblocks that have GUI slots not correctly aligning inventory. Closes #334. + Added a Base Class to help with Dev/ASM functionality. + Added pollution info to scanner data for Multiblocks. + Added muffler requirement to Ore Washing plant tooltip. $ Fixed minimum casing count required on Wash Plant and Fishing Pond. $ Added a Multiblock feature that clears the Input Hatch/Bus recipes locks whenever it is mode swapped with a screwdriver. $ Fixed Australian Trees generating partially floating, this reduces the denseness of the Australian Forest Biome as the trees now require a more solid plantable area. $ Australia Biome generation improvements. + Added a Custom ore Generator based on vanilla to Australia. + Added some custom trees and further tweaked the Australian Biomes. % Tweaked Loot in Shacks. % Slightly tweaked Shack structure. % Changed the Villagers the spawn in Outback/Desert biomes to be exclusively Natives. % Tweaked debug tool to not remove GT ores and tiles. % Changed the hut the natives get, it's now more of an igloo shape. $ Fixed BoP Issue with Australia Generation. + Added various structures for the new villagers in Australia. $ Fixed an issue with the Trader's Trade Handler. + Added Large Ravines to Australia. % Trying to learn more about World Gen.
$ More work on Australia and Villages. + Added 5 new biomes to Australia. % Changes to certain things about Australia. $ Further improvements to Australia. $ Work on Australia world generator. + Added a new Dimension, Australia. % Stopped Custom Villagers spawning as professions that aren't custom. % Trade improvements for some Villagers. $ Fixed a bug in AutoMap mapping to internal name map. + Added some double item trades to Aboriginals. $ Fixed an error in XSTR.java where the maximum bound for nextInt(x) could be 0. $ Fixed some Aboriginal Trader Logic. + Gave Aboriginal villagers some broad trade options. + Decided that villagers need a chance to be Scottish, so I added some Scottish first names in. % Cape list tweak for new Tester. % Tweaked Changelog Head to compare against in build script. - Removed lots of logging. ^ Version Bump for Local build. $ Fixed Wireless Chargers not properly charging in Long-Range mode. Fixes #291 & Fixes #326. $ Fixed Wireless Chargers not properly filling items up with charge, due to the difference being smaller than the input voltage. % Changed Wrought Iron Frame to Iron Frame in the Mining Explosives recipe. % Allowed covers on Adv. Boilers, Semi-Fluid Generators & Energy Buffers. Closes #325. % Improved Pollution Tooltips and other Tooltips in general for Multiblocks. % Rebalanced Pollution for some Multiblocks and added some to others. (This may break existing Multiblocks which may now require a muffler hatch.) Closes #328. $ Fixed some recipes not working in the Large Centrifuge and Large Electrolyzer. Closes #324, Closes #321. $ Fixed some Forestry Frame Recipes not working as intended. $ Further improvement to recipe system. $ Fixed most recipe generation issues, now it's highly optimized. $ Fixed issue where custom Rings had a crafting recipe using a wrench and a rod. $ More work trying to fix recipe generation. + Added in a Villager Replacer. $ More work fixing the recipe system. $ Fixed Villagers not using the correct custom trades. % Changed the Industrial sifter requiring exact amounts of in/output busses. + Added extra GTNH checks on old circuit features. - Disabled Sulfuric Chem for the time being. $ Tried to fix all the recipes I borked. % Hopefully improved recipe loading by several factors. % Re-arranged spawner code during loading. $ Hopefully recipe Creative Tabs issues. $ Fixed profession of one of the new villagers. + Added 3 villager types with custom skins. + Added some trade templates to all three villagers. + Added localization for all new villagers. $ Improved handling of Custom Skins for Villagers. + Added lang file updates. % More work on Spawners. % More work on Villagers. $ Fixed Custom Spawner Generation. $ Fixed Custom Spawner Registration. $ Fixed Spawner importing private static fields from the base TileEntity class via reflection. $ Fixed Spawner writing type to NBT. $ Fixed Fish Oil extraction of Pam's Fish not aligning with GTNH. + Added framework for custom spawners. + Added the base work for custom villagers. - Disabled GT++ Trinium Ore from generating at all in GTNH. ^ Version Bump to 1.7.02.00-fresh. + Enabled placeholder Fishing plugin. - Disabled Sulfuric Chem rebalance internally, Config option temp. does nothing. $ Fixed Debug logging for removed recipes. + Added logging for recipes that get removed. + Added a config option for the GT6 Sulfuric Acid recipe changes. % Reworked some of the Plugin System. + Added in GT6 style Sulfuric acid and Sulfur Trioxide recipes. $ Added missing LCR recipes for Styrene. $ Stopped Tungsten Carbide cells generating. Fixes #295. % Added Tooltip to Adv. EBF to note the new requirement of a Pyrotheum Vent. % Improved Custom Fluid Hatch Tooltips. + Added custom fluid hatches for Pyrotheum and Cryotheum. + Added plain-text changelog build script. ^ Version Bump for nightly build. + Added Trinium Ore and Byproducts. $ Tried to fix loading of some recipes. $ Fixed a bug in the Fluids recipe generator. + Added new recipe for HG-1223. $ Fixed generation of mixer recipes, which will now use circuits if the length < 4. $ Properly disabled the advanced mixer, after a futile previous attempt. $ Fixed canning/extraction recipe generation not working correctly. Fixes #317. $ Advanced boilers now consume the correct 1:160 water:steam ratio and produce the correct amount of steam per second. Fixes #314, also closes https://github.com/GTNewHorizons/NewHorizons/issues/3133. - Removed bundled COFH energy API. $ Tried to fix Containment Frame not having a valid recipe. $ Hopefully fixed the Large Electrolyzer & Centrifuge not processing recipes like NEI would show. Closes #300, Closes #293, Closes #292. + Added the Industrial Mixer. + Re-added the processing recipes for all of Pam's fish. Closes #307. + Added low efficiency mode to the Pollution Scrubbers, allowing Rotors to be saved. Closes #312. + Added ability for Ore Wash Plant to hand Chemical Bathing. Closes #289. % Made Multi-Machine now have a Fluid Extractor mode, this has replaced the Distillery mode. Closes #306. % Updated Multi-Machine manual, to reflect mode C being enabled and it's new Fluid Extractor mode. $ Fixed High Temp Pipe capacities. $ Fixed Ore Wash Plant Tooltip. Closes #302. + Added some small capacity, high temp fluid pipes. Closes #309. + Added fluid solidifier recipes for Rods, Long Rods, Bolts, Screws and Rings in GTNH. Closes #310. + Added a display string to the GUI of the threaded buffers, showing seconds remaining before the thread belonging to this buffer is released. This will also show ms/25 lag info someday. + Added invokeGC() to SystemUtils.java. % Changed max thread life to 300 seconds. - Removed useless EIO tooltip variables. $ Reduced cpu usage in EIO tooltip handler. $ Made GTPP clean up any left-over threads when the server shuts down (Mostly for SSP memory leaks). $ Made each buffer get a unique thread. Thread life reduced greatly and capped out at 32k seconds. $ Fixed GUI issue with new super buffers. $ More work on threaded super buffers. $ Fixed the infinite item holder. + Attempted to make some server friendly threaded Super Buffers. + Initial work on an infinite item holder, for test setups. 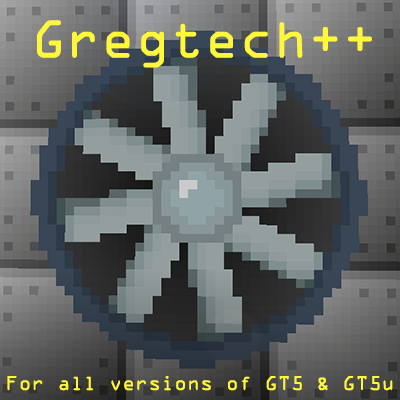 % Renamed GregtechSuperTanks.java to GregtechSuperChests.java. $ Made the Keyboard checks safer. Should prevent console spam/logging. $ Fixed Curse Changelog Template.